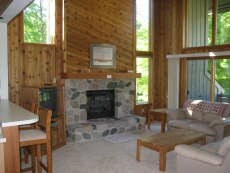 Situated at the base of Nub’s Nob Ski Resort, Hamlet Village Condominiums are the perfect accommodations for your Northern Michigan Ski Vacation. Just steps from the units are the chairlifts to the top of Nub’s Nob. Guests can take one of the lifts directly to the top and ski down the other side of the mountain to the lodge to purchase lift tickets. An exhilarating day of skiing is simple…there’s no driving, no traffic, no parking quandries and no equipment to lug around. Groomed x-country ski trails crisscross the property so you can leisurely explore Mother Nature’s beauty on cross-country skis. The units vary in size from one to four bedrooms. The larger units can sleep up to 12 with ease. And regardless of the size, most of the units feature a natural stone fireplace and a whirlpool tub. These luxury units include use of heated pool, whirlpool, sauna & tennis courts.